I did a wee test session at Kames a couple of weeks ago to try out a couple of things. When I got back home, I noticed that the rear anti-roll bar bracket had sheared off the wishbone. Seems the droplinks had been incorrectly fitted and that might have put additional stress on the bracket. 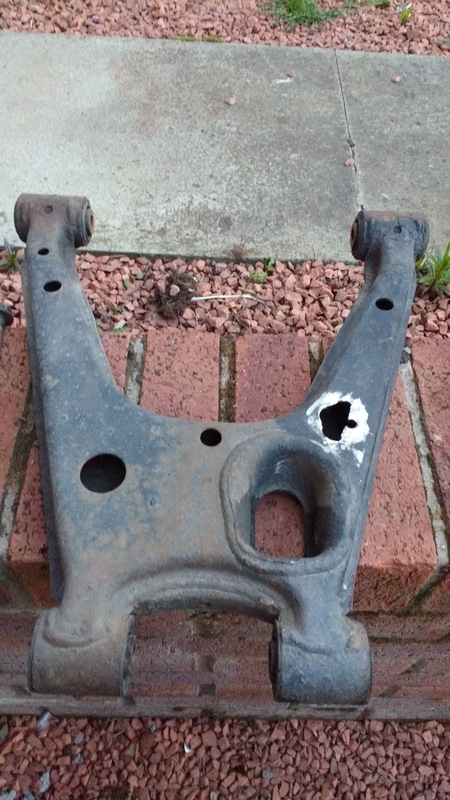 Getting hold of a replacement wishbone proved tricky - turns out they are becoming hard to source secondhand due to rust issues and new ones are very expensive. However, I managed to source a couple from another MX5 competitor and duly replaced the broken arm. 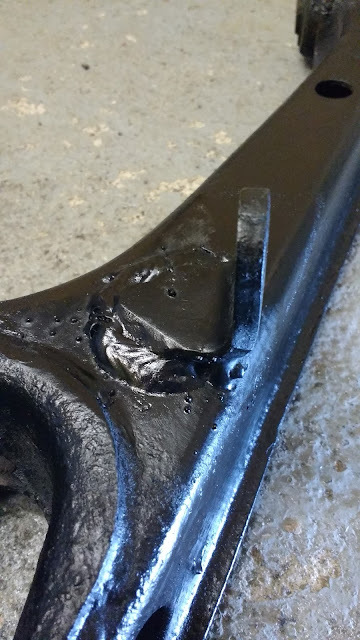 In the meantime, my neighbour borrowed my MIG welder and before he returned it I suggested he have a go at welding the bracket back on the broken arm. He did a good job so I decided to fit that arm back on. Hopefully it will all be good as I have a busy racing weekend coming up. 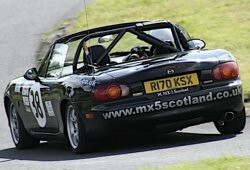 First I'm off to Kames on Saturday where there will be 15 MX5s slogging it out in the EunosEcosse/Lowland Speed Championship. Then I drive straight down the M6 for a hillclimb at Scammonden Dam, near Huddersfield on Sunday. The entry list is sparse for this but my old sparring partner, Chris Harris is there with his Lotus Elise so that should be fun. Last time I was there was in July 2009 when I set my PB of 30.71 secs. On that day, I was beaten by Chris Harris in his Lotus who did a 28.98 second run. Here's hoping the tables are turned on Sunday! The weekend at Kames proved very fruitful with a new personal best of 98.71 secs on Saturday only 4 tenths behind first place and good enough for third in a class of 17. Sunday wasn't quite so good. I managed a 99.96 sec run in the afternoon but missed out on my final timed run due to a mix up with numbers. It was still good enough for third place so not all doom and gloom. 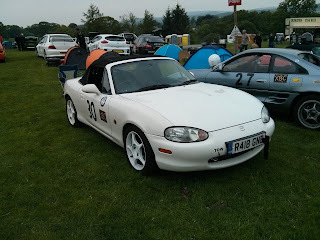 Next outing for me will be Kames in mid-May but the MX5 register guys and the XBC guys will be at Doune this weekend. The 2016 sprint and hillclimb season begins tomorrow with a weekend double header at Kames in East Ayrshire. I've done no development work on the white racingFive over the winter but I did undertake some maintenance jobs to hopefully improve reliability. So, this weekend, there are 17 entries in the MX5 class - close competition is guaranteed by tight regulations. I'm hoping for a top 5 position but most importantly I really want to beat my personal bests of 100.07 sec Clockwise and 93.55 sec anti-clockwise. Well, it has been a long time since I put finger to keyboard and wrote up my blog. For the past two years I've been messing about with old Mercedes Benz, eating strawberries on the lawn at classic car shows and generally wishing I had another racingFIVE. 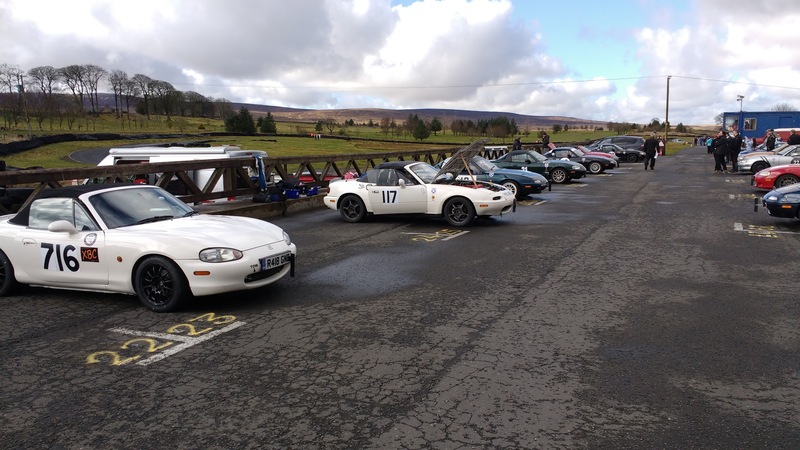 In the three years I have been away from speed events, a dedicated MX5 class has been created with over 25 registrants and regularly 10-15 cars entered. The racing is close and affordable - I needed to be part of that! In January, I picked up what I thought might be a possible race car - a 2001 Mk2.5 SVT MX-5. 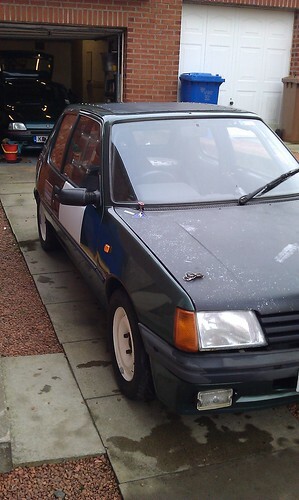 It had an MOT, it ran OK but had some bodywork issues. At £400 I thought I couldn't go wrong. I then spent the next few weeks dismantling, uncovering rust and welding in patches. 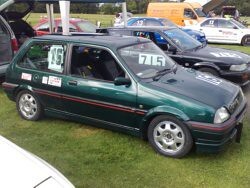 I would have carried on but I then became aware of a MK2 RS with some important modifications which I thought would be ideal for sprints and Hillclimb. Only problem was - it was in Reading! Anyway, I got someone local to check out it wasn't a complete rotbox, did a deal on the phone and was down two days later to pick it up. I did my first event at Kames in May and managed to get a decent 101.08sec run which was good enough for 5th in class. I travelled down to Barbon in June and managed to beat my previous personal best, posting 31.95 sec. Yesterday, I was at Forrestburn and again beat my previous MX5 personal best posting 56.98 sec. The guys in the paddock are a great crowd. The banter is infectious and everyone helps out when there is a problem. I have missed this racing and it is great to be back. I hope you enjoy reading about my exploits competing in speed events in the UK. Speed events are run at race-tracks, kart-tracks and, in the case of hillclimbs, up hills! Cars are timed to the nearest 100th of a second and the fastest time wins. 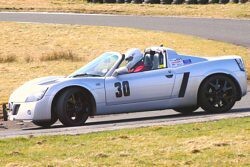 Between 2007 and 2009, I competed in a standard Mazda Mx-5 but this was retired at the end of the 2009 season and replaced with a Vauxhall VX220 which I ran for the 2010 season. 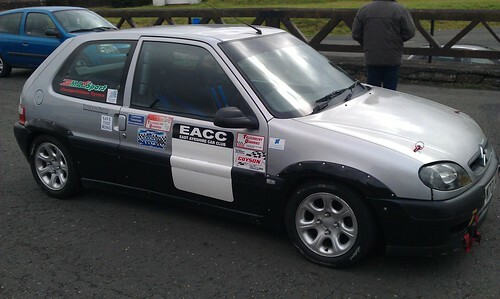 For most of 2011, I competed in a 1989 Peugeot 205 1.4. This was replaced in August 2011 with a Citroen Saxo VTS. The Saxo was sold in December 2012. After a sabbatical of 3 years, I returned to sprinting in a 1998 Mazda Roadster RS in 2015.